After our beloved Kodi’s death, we prayed that God would lead us to the perfect new companion. We were confident it would be another white German Shepherd. But, this past Sat., we felt led to adopt this magnificent, 90 lb. 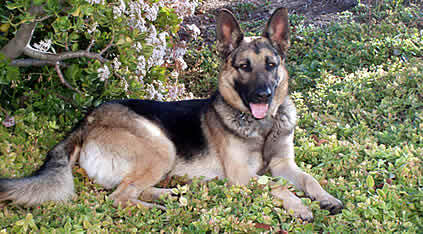 well-behaved and obedient black and tan 2 yr. old from the Orange County German Shepherd Rescue in Yorba Linda. So far, he has proven to be a wonderful pet and is bonding well to his new family, home, and San Diego environment. (And we are bonding quickly to him!) He LOVES walks, rides in the car, the doggy park, his new doggy friends in the neighborhood and is intrigued with our Buddy kitty. Meet the STRONGEST new member of the family – SAMSON (formerly Zocky). Anyone for a fast-paced walk? ?